May | 2009 | Let Teddy Win! After last night’s episode in which the Oriole bird tackled Teddy Roosevelt, our 26th president wasn’t going to leave anything to chance. Today at Nationals Park, Teddy spotted the orioles mascot right out of the starting gate, ran after him and promptly slammed The Bird into the outfield wall, taking him down and out of the action. We’ve rarely seen Teddy so motivated. In fact, the Bull Moose acted with such efficiency that he was able to spin around and rejoin the race, giving the other presidents a run for their money and almost catching George. Washington took his second presidents race of the series, pulling him into a tie for 2nd with Thomas Jefferson to finish the homestand. The racing presidents are back in action June 2 when the Giants come to town. Photo courtesy of James Littlefield. 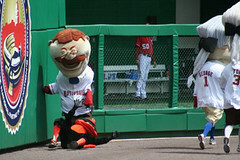 In the first game Friday night, Nationals mascot Screech prevented any funny business by fighting The Bird early in the game, and getting the O’s mascot escorted out of Nationals Park before it had any chance to interfere with the presidents race, which George Washington took at the wire. Tonight, it was Teddy who grabbed the early lead. The crowd roared as the presidents raced down the home stretch, tasting a first-ever victory for #26; but those who were in the stands last June felt an uncomfortable sense of déjà vu. There was the Oriole Bird, appearing out of nowhere in the foul territory. There would be no tripping this time. Not leaving anything to chance, The Bird tackled Teddy to the ground. One consolation for Teddy: The Bird got his. George Washington was right behind and leveled Teddy’s attacker. 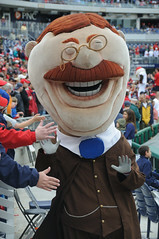 The Washington Nationals have put George, Tom, Abe, and Teddy to work to build buzz around town for the current homestand. Yesterday, Teddy Roosevelt was spotted with Washington Nationals co-host Yolanda Makle outside the Gallery Place Metro station, handing out discount coupons for the weekend series against the Baltimore Orioles. Today Makle reports via Twitter that she is riding around DC in pedicabs with the George, Tom, Teddy, and the Nat Pack. If you are heading out for lunch, look lively! 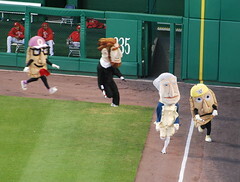 The Pittsburgh Pirates racing pierogies continued their 4-game visit to Nationals Park with a set of relay races against the Washington Nationals racing presidents. Last night’s game featured a traditional baton relay, with Tom and George pacing the field over sets of hurdles placed along the warning track. Tonight, the teams were switched, as each racing president was paired with one of the Pittsburgh pierogies in a comical and painfully slow 3-legged race. Teddy and Sauerkraut Saul pulled into the lead before tripping and falling along the first base line. Pittsburgh favorite Jalapeño Hannah was tied to Abe Lincoln and positioned to take the lead when Teddy and Saul collapsed. The Washington Nationals have once again released a coupon code “for Teddy’s friends”: Order online at Nationals.com using Coupon Code “TEDDY” and get half-price tickets in select seating sections for this week’s 4-game series vs. the Pittsburgh Pirates. The coupon code is valid only for online orders and may be used to get outfield box seats, outfield corner, or mezzanine seats for $14.00 to $17.00 each. Note also that $5.00 walk-up grandstand tickets have been readily available at the Nationals Park box office during this homestand. In my opinion they are the best entertainment value in DC. Grandstand seats are available before the game at the Nationals ticket office outside the Center Field Gate.